They’re heeeerrrreee- the enormously thick, wickedly wonderful, 800+ page fashion bibles known as The September Issues. (And yes, reverence dictates that they be capitalized). As a designer, The September Issues act as a barometer of what clients will be seeking each season, what color schemes will debut in retails stores, even how far I can push my own collections. September Issues introduce us to the trends, ideas and themes of the Fall season. They are delicious and wonderful. Flipping through several magazines this week, here are a handful of our favorite trends for baubles this fall. MINIMALISM: Minimalistic and clean lines debut at Celine (top). 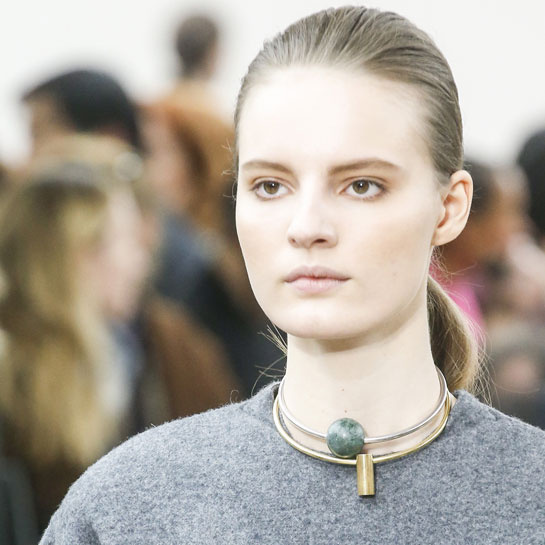 Each piece of Celine jewelry stands on its own merit, or can be stacked with others for a textural look of layers. Louis Vuitton (bottom) plays with a clean collar, creating a simple shape with a big statement. PUNK + GRUNGE: Rodarte (top) introduces punk through plays on shape and form, using barbed wire and hardware as inspiration. 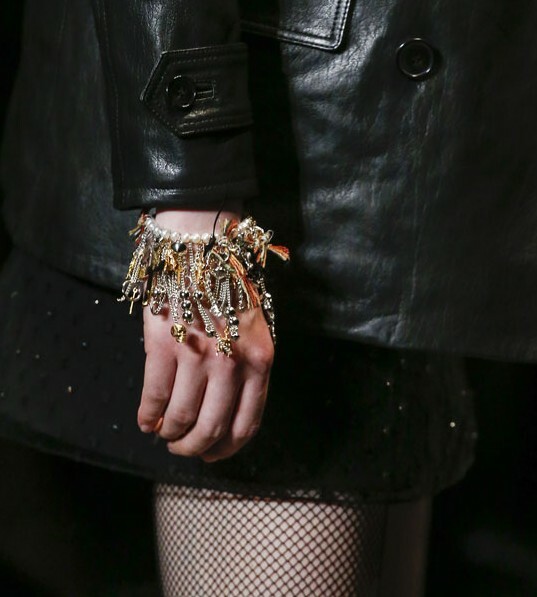 Saint Laurent (bottom) pulled 1990s grunge aesthetic for inspiration – biker boots and leather minis paired with pearl necklaces, layered chains and charm bracelets. High and low; messy and undone, punk pops up amongst several designers this season. PEARLS: Though clearly biased, we are excited to see pearls in new forms this season. Pearls at Chanel are not unusual; pearls adorning shoes at Chanel is. Yummy and delicious, Chanel pushes pearls to new heights – er lows – on heels, platforms and flats. Dior (top) swaths its models in pale metallics and pastels, accessorized with rings across all fingers for a modern twist on “brass knuckles”. SCALE: Giambattista Valli punctuated the clean lines and angular cuts of his evening gowns with ENORMOUS metal cuffs. 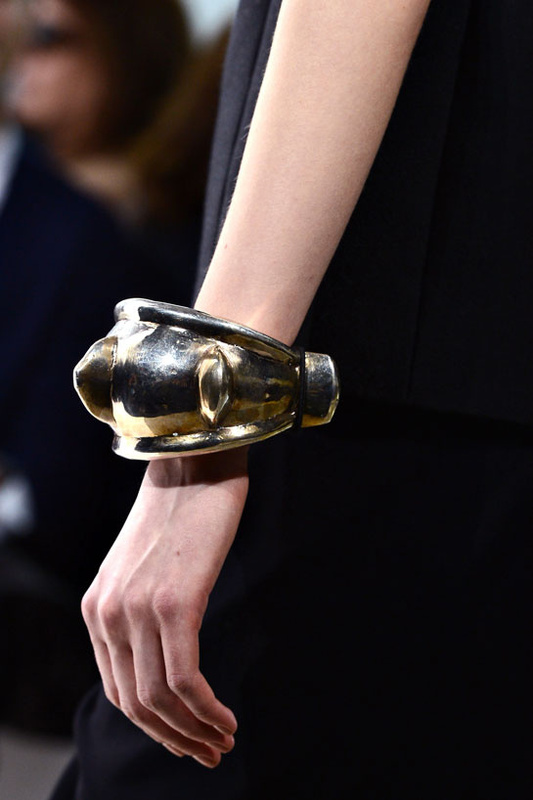 Size and proportion are key here – several designers push the boundaries of how large or small jewelry plays against the clean lines of clothing. This entry was posted on August 28, 2013 by elisabeth in fashion + designers, inspiring styling and tagged Celine Jewelry, chanel jewelry, Dior pearls, Fall jewelry 2014, Giambattista Valli jewelry, The September Issue.